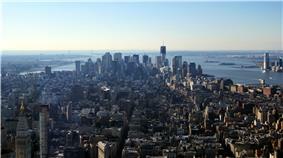 The Lower Manhattan skyline in December 2011, from Midtown Manhattan. One World Trade Center can be seen, under construction, in the background. 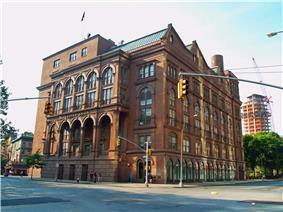 The Cooper Union at Astor Place, where Abraham Lincoln gave his famed Cooper Union speech, is one of downtown's most storied buildings. 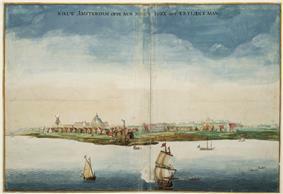 Soon thereafter, most likely in 1626, construction of Fort Amsterdam began. Later, the Dutch West Indies Company imported African slaves to serve as laborers; they helped to build the wall that defended the town against English and Indian attacks. Early directors included Willem Verhulst and Peter Minuit. Willem Kieft became director in 1638 but five years later was embroiled in Kieft's War against the Native Americans. The Pavonia Massacre, across the Hudson River in present-day Jersey City resulted in the death of 80 natives in February 1643. Following the massacre, Algonquian tribes joined forces and nearly defeated the Dutch. The Dutch Republic sent additional forces to the aid of Kieft, leading to the overwhelming defeat of the Native Americans and a peace treaty on August 29, 1645. 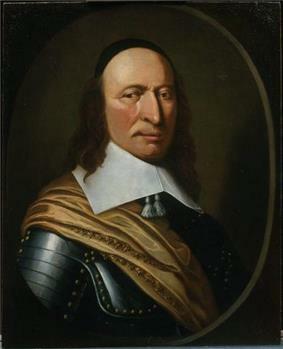 On May 27, 1647, Peter Stuyvesant was inaugurated as director general upon his arrival. The colony was granted self-government in 1652, and New Amsterdam was formally incorporated as a city on February 2, 1653. The first mayors (burgemeesters) of New Amsterdam, Arent van Hattem and Martin Cregier, were appointed in that year. 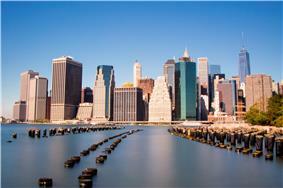 In 1664, the English conquered the area and renamed it "New York" after the Duke of York. At that time, African slaves comprised 40% of the small population of the city. 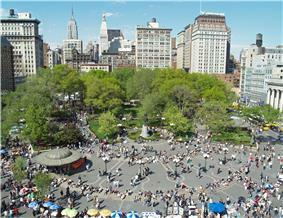 Some had achieved freedom under the Dutch and owned 130 acres (53 ha) of farms in the area of present-day Washington Square. The Dutch briefly regained the city in 1673, renaming the city "New Orange", before permanently ceding the colony of New Netherland to the English for what is now Suriname in November 1674. The new English rulers of the formerly Dutch New Amsterdam and New Netherland renamed the settlement New York. As the colony grew and prospered, sentiment also grew for greater autonomy. In the context of the Glorious Revolution in England, Jacob Leisler led Leisler's Rebellion and effectively controlled the city and surrounding areas from 1689–1691, before being arrested and executed. 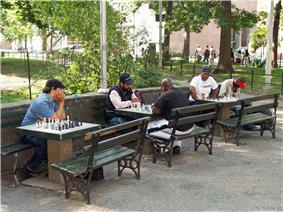 By the 1740s, with expansion of settlers, 20% of the population of New York were slaves, totaling about 2,500 people. After a series of fires in 1741, the city became panicked that blacks planned to burn the city in a conspiracy with some poor whites. Historians believe their alarm was mostly fabrication and fear, but officials rounded up 31 blacks and 4 whites, who over a period of months were convicted of arson. Of these, the city executed 13 blacks by burning them alive and hanged 4 whites and 18 blacks. ^ "[B]orough presidents ... responsible for local administration and public works." ^ See, e.g., Hotels: Downtown below 23rd Street, Time Out New York; "Residents Angered By Bar Noise In Downtown Manhattan", NY 1 News, March 3, 2006. Both retrieved on December 3, 2007. ^ "LARGE EMPLOYER GROUP APPLICATION". EmblemHealth. Retrieved on August 12, 2011. "EmblemHealth, 55 Water Street, New York, New York 10041 HIP Insurance Company of New York, 55 Water Street, New York, NY 10041 Group Health Incorporated, 441 Ninth Avenue, New York, NY 10001"
^ "." PR Newswire. Retrieved on July 20, 2014. ^ "Playin fair video-game manufacturers target an untapped market -- Girls". Pittsburgh Post-Gazette. June 12, 1994. K-1. Retrieved on July 28, 2010. "Meanwhile, over at Hi Tech Expressions, a New York-based software company,"
The largest New York City Subway hub, the Fulton Center in Lower Manhattan, re-opened in November 2014 after a $1.4 billion reconstruction project necessitated by the September 11, 2001 attacks and complicated by Hurricane Sandy in 2012. Upon opening, this transit hub linking nine existing subway lines was expected to serve 300,000 daily riders. The World Trade Center Transportation Hub and PATH station is scheduled to be completed in 2015. The Jacob K. Javits Federal Building is located in Civic Center. It includes the Federal Bureau of Investigation New York field office. PR Newswire, at 350 Hudson Street. Verizon Communications, at 140 West Street. Lower Manhattan is the fourth largest business district in the United States, after Midtown Manhattan, the Chicago Loop, and Washington, D.C., and will regain the title of third after the completion of 1 World Trade Center, and the three other skyscrapers at the site. Anchored by Wall Street, New York City functions as the financial capital of the world and has been called the world's most economically powerful city. Lower Manhattan is home to the New York Stock Exchange, on Wall Street, and the corporate headquarters of NASDAQ, at 165 Broadway, representing the world's largest and second largest stock exchanges, respectively, when measured both by overall average daily trading volume and by total market capitalization of their listed companies in 2013. Wall Street investment banking fees in 2012 totaled approximately US$40 billion. As reflected in popular culture, "Downtown" in Manhattan has historically represented a place where one could "forget all your troubles, forget all your cares, and go Downtown," as the lyrics of Petula Clark's 1964 hit "Downtown" celebrate (although the artist later clarified that she naively believed Times Square to be "downtown," and was the actual inspiration for the hit single). The protagonist of Billy Joel's 1983 hit "Uptown Girl" contrasts himself (a "downtown man") with the purportedly staid uptown world. Likewise, the chorus of Neil Young's 1995 single "Downtown" urges "Let's have a party, downtown all right." 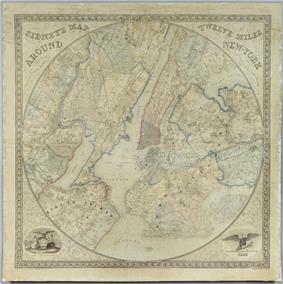 The area contains many historical buildings and sites, including inaugurated as the first U.S. President, Fraunces Tavern, New York City Hall, the New York Stock Exchange, renovated original mercantile buildings of the South Street Seaport (and a modern tourist building), the Brooklyn Bridge, South Ferry, embarkation point for the Staten Island Ferry and ferries to Liberty Island and Ellis Island, and Trinity Church. Lower Manhattan is home to some of New York City's most spectacular skyscrapers, including the Woolworth Building, 40 Wall Street (also known as the Trump Building), the Standard Oil Building at 26 Broadway, and the American International Building. Perhaps Lower Manhattan's most renowned landmark is now the former World Trade Center site. Before the September 11 attacks, the Twin Towers were iconic of Lower Manhattan's global significance as a financial center. The new office towers (including One World Trade Center) are expected to restore the Lower Manhattan skyline and give it the title of the third largest central business district in the United States, behind Midtown Manhattan and the Chicago Loop. The 9/11 Memorial has become a popular draw for visitors. The New York Stock Exchange, the world's largest by total market capitalization of its listed companies. In June 2015, The New York Times wrote that Lower Manhattan's dining scene was experiencing a renaissance. On September 11, 2001, two of four hijacked planes were flown into the Twin Towers of the original World Trade Center, and the towers collapsed. The 7 World Trade Center was not struck by a plane, but collapsed because of heavy debris falling from the impacts of planes and the collapse of the Twin Towers. 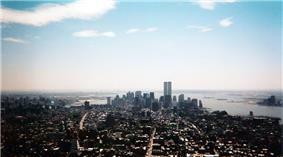 The other buildings of the World Trade Center complex were damaged beyond repair and soon after demolished. 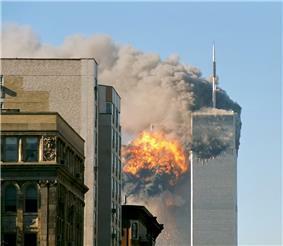 The collapse of the Twin Towers caused extensive damage to surrounding buildings and skyscrapers in Lower Manhattan, and resulted in the deaths of 2,606 people, in addition to those on the planes. Since September 11, Lower Manhattan lost much of its economy and office space, but most of Lower Manhattan has been restored. However, many rescue workers and residents of the area developed several life-threatening illnesses and some have already died. The area's economy has rebounded significantly since then. The Lower Manhattan Development Corporation has consummated plans to rebuild downtown Manhattan by adding new streets, buildings, and office space. The National September 11 Memorial at the site was opened to the public on September 11, 2011, while the National September 11 Museum was officially inaugurated by President Barack Obama on May 15, 2014. As of the time of its opening in November 2014, the new One World Trade Center, formerly known as the Freedom Tower, is the tallest skyscraper in the Western Hemisphere and the fourth-tallest in the world, at 1,776 feet; while other skyscrapers are under construction at the site. In 1968, the Stonewall riots were a series of spontaneous, violent demonstrations by members of the gay community against a police raid that took place in the early morning hours of June 28, 1969, at the Stonewall Inn in Greenwich Village. They are widely considered to constitute the single most important event leading to the gay liberation movement and the modern fight for LGBT rights in the United States. 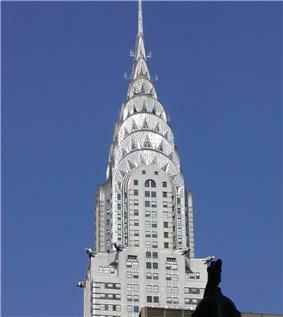 Throughout the first half of the 20th century, the city became a world center for industry, commerce, and communication. zoning controls, especially in Lower Manhattan. Washington Market was located between Barclay and Hubert Streets, and from Greenwich Street to West Street. The area remains one of the few parts of Manhattan where the street grid system is largely irregular. 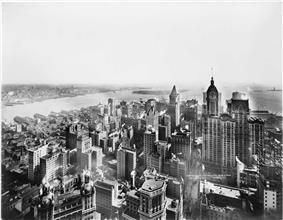 Throughout the early decades of the 1900s, the area experienced a construction boom, with major towers such as 40 Wall Street, the American International Building, Woolworth Building, and 20 Exchange Place being erected. 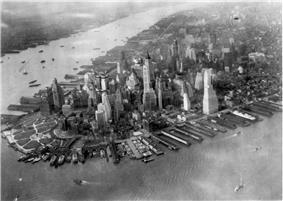 New York City was greatly damaged twice by the last British forces left the city. In 1771, Bear Market was established along the Hudson shore on land donated by Trinity Church, and replaced by Washington Market in 1813. The Battle of Fort Washington the island was effectively left to the British. The city became a haven for loyalist refugees, becoming a British stronghold for the entire war. Consequently, the area also became the focal point for Washington's espionage and intelligence-gathering throughout the war.